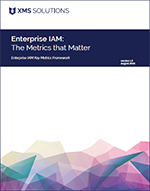 Metrics are critical to the success of an enterprise’s Identity Access Management program, IAM initiatives and IT operations, because they enable IAM leaders, other stakeholders and decision makers to recognize the value of those efforts. However, organizations can be overwhelmed by the number of IAM elements that can be measured and reported on. This whitepaper breaks down the XMS Solutions' Enterprise IAM Key Metrics Framework, a collection of indicators justifying IAM investments and tracking improvement over time. Each organization will vary at some level in terms of specific activities or tasks to track, but this framework provides the foundation for developing an Enterprise Scorecard for IAM that tracks the value of the investment to IT and end users.